23/09/18. Bundesliga (Germany). Germany Bayer Leverkusen - Mainz. Goals. Home Previews 23/09/18. Bundesliga (Germany). Germany Bayer Leverkusen - Mainz. Goals. Sometimes it turns out that a team has a very uncomfortable opponent, who is difficult to beat. And even if everything says that there will be a win (statistics, bookmaker odds, the form of teams, etc.) but nevertheless the team plays unconfidently in such matches, and due to high odds it can be used for good profit. The team of the site corner-stats.com believes that for Bayer Leverkusen such a team is Mainz. That is, even with a odds of 3 for Mainz win, the profit would be 5 units (7 * 3 - 16). And if we take matches for the seasons of 2013-2018, then the profit at flat bet would be 9.83 in 10 matches. 6 of Bayer's 16 home games with teams similar to Mainz in the 2016-2018 season, Bayer lost. 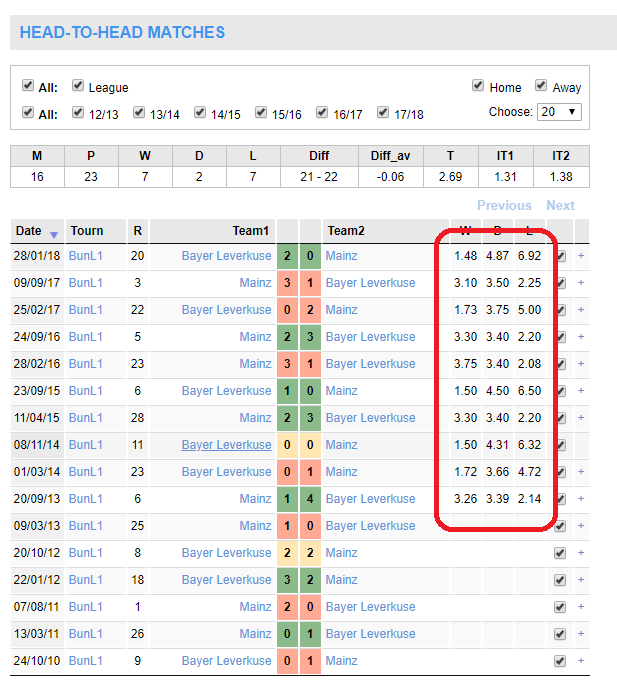 In this case, if you take all the matches (not only home), Bayer, then the statistics are similar - 8 defeats in 23 games. 1 of 13 Mainz away matches with teams similar to Bayer in the 2016-2018 season, Mainz won. As you can see, similar matches of Mainz don't show value for its win. But Bayer stats shows very good value, which shows that the bookmaker does not always correctly assess the team in such matches. The team of Corner-stats.com considers the bet on Mainz's win at a 6.11 odds in Pinnacle very good.